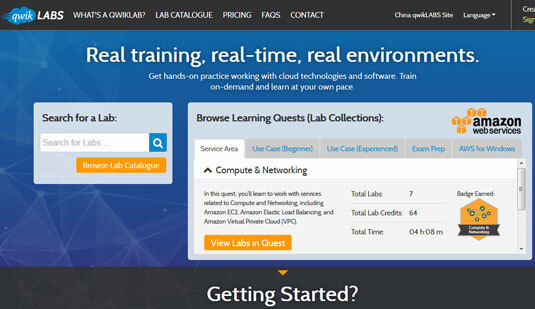 Online labs can help some folks learn how to use AWS (Amazon Web Services) more quickly. People learn differently. For some people, structured, hands-on activities beat reading or experimenting when it comes to learning something new. Even if hands-on activities aren’t a first choice, having multiple learning-activity types tends to reinforce new skills and make them easier to retain. That’s why an online lab, such as quikLABS, in which you can obtain structured, hands-on activities , can be so important to getting up to speed quickly. The figure shows the main page for this site. quikLABS provides you with hands-on activities that help you learn faster. quikLABS takes a gamelike approach to learning. You go on quests to obtain specific new skills. Each time you complete a quest, you get a badge. In this way, the site offers positive feedback to make the learning process easier. You use real Amazon services rather than mockups during the learning phase, so what you learn in quikLABS applies directly to what you need to use AWS. As with most games, you need credits to buy services, and the credits cost money. As you can see in the figure, the Compute & Learning lab costs 64 credits. The pricing guide is available. The lab catalog gives you a list of each element for each of the quests and the number of credits required to complete that element. Fortunately, you can try before you buy. Check out the free labs. Just click View Free Labs to see a complete list of the free labs that you can try.